Eclipses look weird in X-rays. When you think of X-rays, you probably have in mind a black-and-white image on a big plastic sheet. It shows an arm, or a set of ribs, unfortunately displaying one or more bones with a break. X-rays are a form of high-energy light; they’re just like the light we see, but each photon has a thousand or more times the energy of a visible light photon. Medical X-rays are made by creating a source of these photons, and aiming them through some part of your body. Denser material, like bones, absorbs the X-rays, but softer stuff lets them pass through. Put some film (or these days, a digital detector) under the beam, and you get the shadowy picture we’re used to. But there are other sources of X-rays in the Universe… like the Sun. It’s actually the brightest X-ray source in the sky, but you’d never know it. Those photons get absorbed pretty efficiently by our atmosphere, which is a nice benefit since X-rays are somewhat lethal to most forms of complex life. But if you get above the atmosphere you can see them easily. We’ve been launching X-ray sensitive telescopes for decades, and one of the latest is the Japanese satellite Hinode (which also has participation from the U.S. and the UK). It stares at the Sun, recording high-energy flares and other events, phenomena violent enough to generate X-rays. In May 2013, the orbit of Hinode around the Earth aligned with the Moon and Sun, producing a series of solar eclipses for the satellite. 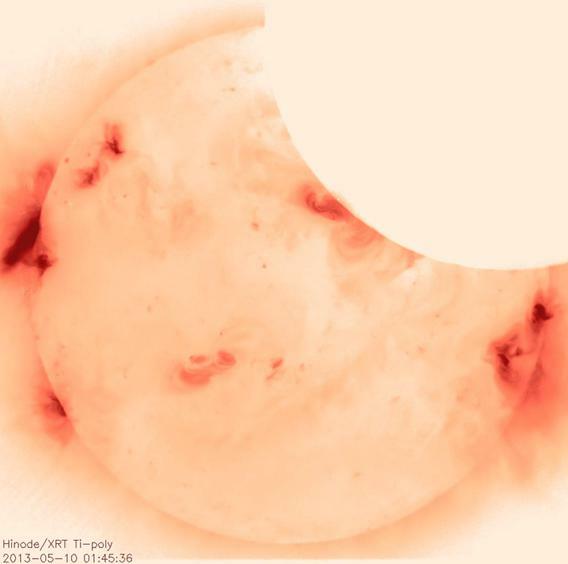 Images of the eclipse were put together by Patrick McCauley of the Harvard-Smithsonian Center for Astrophysics, and they’re probably not like anything you’ve ever seen before. The images are negative, so bright spots appear dark, and vice-versa. As Hinode orbits the Earth, its position constantly changes relative to the Moon and Sun, so the Moon’s path appears curved, and at different times moves across different parts of the Sun. Three separate eclipses are shown, looped twice each. Sunspots are regions of intense magnetic activity on the Sun, and easily produce X-rays; you can see them as the more concentrated regions of red and black, convoluted and twisted tendrils of magnetic energy streaming out of them. The Moon, on the other hand, is dead in X-rays, and appears as a blank white disk. Pretty cool. And useful: In some cases, these eclipses can be used to help focus the camera! It’s a rather mundane use of an astonishing and spectacular astronomical phenomenon, but hey, you take what you can get. SDO lunar transit: now with video! ANOTHER insanely awesome shot of the solar eclipse? !